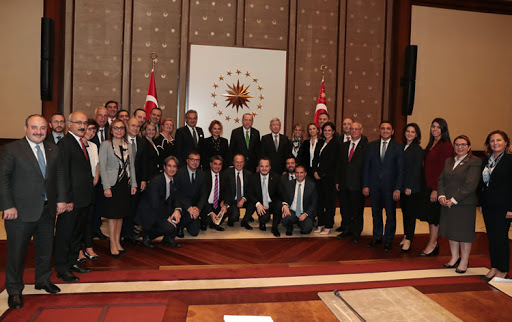 YASED International Investors Association organized a meeting on September 19, 2018 at Külliye in cooperation with AmCham, coordinated by The Presidencial Investment Office. American companies representatives in the Board of Directors of YASED and AmCham participated to this meeting. The meeting agenda focused on the relationship between Turkey and the USA including the economic developments in the recent period. After the meeting with the President, Ahmet Erdem, Chairman of YASED, stated that in addition to the current economic and political agenda, recent developments in Turkey-US relations were evaluated during the meeting. Also he stated that the actions that could be taken in cooperation with the government were discussed in order to ensure that these developments do not have a negative effect on trade and investments. Erdem also stated that the President’s emphasis on how he welcomed international companies investing in our country with their production, export and employment as Turkish companies has greatly encouraged international investors. “International direct investors add great value to Turkey’s economy through production, creating employment opportunities, providing exports and transferring technology. As YASED, representing investors from 5 continents and 25 countries, we believe in Turkey’s potential and power, and we have a long-term vision for Turkey. In line with our belief in Turkey, we will continue to increase our contribution to the economy day by day during these challenging times. Furthermore, another important goal we have is to work towards increasing the perception of Turkey as a center of attraction for international investments.